Whether a pregnant woman has the right to refuse surgery to save the child she is carrying has become the subject of America's latest culture war. Banners and badges have been banned from the courtroom where Melissa Ann Rowland, whose case is being championed by women's activists and civil liberties campaigners, is to stand trial. The judge believes the passions sparked by the case of the 28-year-old, charged with murder after allegedly refusing a Caesarean that doctors say was needed to save her twins, would jeopardise her right to a fair trial if allowed to spill over into the courtroom. To the prosecution - and many Americans - Ms Rowland displayed a "depraved indifference to human life" when she apparently ignored doctors' advice to undergo the operation immediately, allegedly for purely cosmetic reasons. 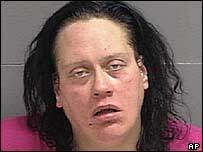 One of her twins was subsequently stillborn. Ms Rowland has for her part categorically denied the suggestion that she refused surgery because she did not want a disfiguring scar, and argued that she was never informed of the need for an immediate operation. But to those who have rallied behind Ms Rowland, her ignorance of the situation or alleged lack of concern for the wellbeing of the twins is not the central issue. They see the case as shining the spotlight on a broader drive to control women's behaviour during pregnancy and undermine abortion rights by conferring the notion of personhood on the unborn. Rights for foetuses, they argue, are being placed squarely above those of their mothers. Precisely what is necessary, Ms Rowland's detractors retort, if unborn babies are to be saved from callous mothers. The concept of foetal rights has made headway in the US in recent years. They are inevitably embraced by those who oppose abortion, but also, increasingly, by those who do not necessarily think terminations are wrong. This week, the US Senate is due to consider a bill which, if approved, would impose criminal penalties on anyone who harms a foetus during an assault on a pregnant woman. The Unborn Victims of Violence Act has already passed by 254 to 163 in the House of Representatives, which rejected a Democratic-led alternative that would have increased penalties for attacks on pregnant women in which the foetus is injured or killed without conferring new rights on foetuses. President George W Bush has endorsed the legislation, which has rode high on a wave of popular disgust at the brutal murder of a young, pregnant woman, allegedly by a cheating husband, last year. Laci Peterson was found washed up on a California beach, with the body of her unborn baby nearby, the umbilical cord still attached. For pro-choice campaigners, the bill is a clear attempt to use a highly emotive murder to endow a foetus with rights, and thus challenge a woman's right to choose. But a number of legal experts and politicians do not agree, pointing to language within the bill that protects those carrying out legal abortions from prosecution. "This bill has nothing to do with abortion," said House Judiciary Committee Chairman James Sensenbrenner. "The Unborn Victims of Violence Act protects the right of a mother to choose to bring her wanted and loved child to term, safe from the violent hands of criminals who would brutally deny her that right." Endowing a foetus with rights does not necessarily undermine a woman's right to choose, some observers note, provided that the woman's rights are always paramount. Yet pro-life campaigners are clear in their own minds as to what the bill will establish. 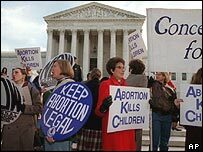 It is widely held on both sides of the abortion divide that a direct attack on Roe v Wade, the 1973 Supreme Court ruling which established a woman's right to abortion, would not be countenanced by the majority. But pro-life campaigners hope that the gradual endowment of foetuses with rights, as the Unborn Victims of Violence Act will do, will encourage a different perception of foetuses and, potentially, provide a legal basis for a challenge to Roe v Wade in the future. "The abortion lobby is frantic," says Michael Schwartz, vice president for government relations for Concerned Women for America, "because this act helps tear down the myth that the unborn child is not a person, which is the foundation of the abortion industry." Opponents of abortion have also been encouraged by the recent ban on what is known as "partial-birth" abortion, an emotively labelled procedure carried out late in pregnancy. The ban, supported by President Bush, constituted the first federal restriction on abortion since Roe v Wade. Political analysts believe the president, who personally believes abortion is wrong, has acted shrewdly on the issue - supporting legislation that it is dear to his conservative base but without alienating the middle ground. "Certainly encroachments on abortion have accelerated under President Bush, but I would be reluctant to put all the changes that we've seen in recent years at his door," says Professor Jennifer Rosato of Brooklyn Law School. "There is momentum at the grassroots level for change, and an increasingly emotional rather than rational response among the American people to foetal-related issues. "Roe v Wade isn't going to be overturned tomorrow, but it is the gradual erosion of rights, little by little, that is the issue. That's where the fight is, and that's what the pro-choice movement must take on."